“Olympic Picasso” Roald is a colorful character. 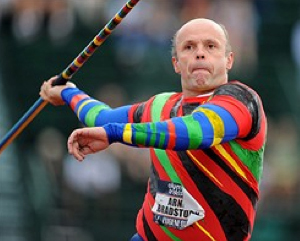 Two-time British Olympian and never-quit thrower Roald Bradstock is the listed holder of the M50 world record in the javelin at 76.16 meters (249-10). He threw that mark in 2012 at the National Training Center in Clermont, Florida. Well guess what? He’s baaaccck. Saturday at the NTC, he chucked the 700-gram stick 66.76 (219-0) to beat the listed M55 WR of 66.11 (216-10) by coach Mike Brown in 2012. (See complete results here.) 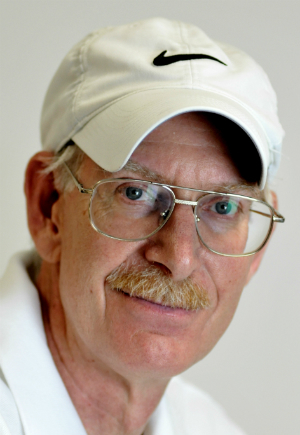 In a Facebook chat with Roald — who competed in the British and U.S. Olympic Trials countless times — I learned that he had enough competitors to qualify for a USATF record. He also had steel tape measurements and his stick was weighed before and after. He hopes to post video of his throws soon as well from the Pure Athletics Elite Meet at Clermont. Nice job, RB! He’s been quiet for a few years.. Looking forward to his video, which are always good lessons.